The corner of Raquel Pennington failed its fighter in the main event of UFC 224, which took place last night at Jeunesse Arena in Rio de Janeiro, Brazil. At the end of the fourth round, after Pennington was already down 40-36 on the judges scorecards to UFC women’s bantamweight champion Amanda Nunes, Pennington said to her corner, “I’m done.” Her corner did not listen to their fighter, and insisted the fight go on, giving her a pep talk and telling her to give it everything she got, without offering any sort of technical advice. The fight went on, and Pennington went out for the fifth round, only to suffer a brutal mauling at the hands of Nunes late in the fifth round, getting her nose shattered and bloodied all over the Octagon canvas, and losing by TKO for the first time in her career. That should have never happened, because the fight should have been stopped before that if Pennington’s corner actually listened to her. The fight should have actually been ruled a verbal submission, because Pennington verbally said she did not want to fight anymore and the corner should have informed the referee by throwing in the towel. The doctor should have also been at least called in to check on the fighter. The fact Pennington’s call to stop the fight happened in-between rounds made it easier for Pennington’s corner to talk to the officials, but they insisted their fighter go out for the fifth round. Pennington should have been saved from all the damage she took late in the fifth, but her corner failed her by allowing the fight to continue, all for the chance of a Hail Mary punch in a fight she was losing huge. 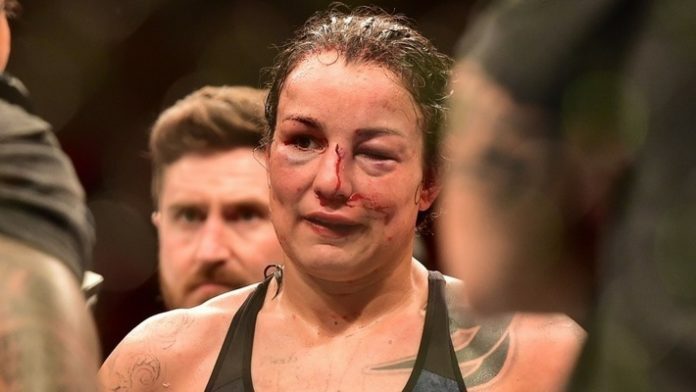 Instead, the fight continued and Pennington took a ton of damage that will undoubtedly affect her for the rest of her fighting days, as we’ve seen many fighters in the past never look the same after a beatdown like this one. All for the small-percentage chance of getting a fifth-round finish in a fight where Pennington was getting completely destroyed by a far superior fighter in Nunes. MMA corners are notoriously bad at stopping fights when their fighter has taken too much damage, whereas in boxing it’s definitely more common. Most of the MMA fights where a fighter has been taking a brutal beating with no chance of a comeback don’t see the corner step in and throw in the towel. I’m thinking about fights like Khabib Nurmagomedov vs. Edson Barboza or Cain Velasquez vs. Junior dos Santos 3. Those fights should have seen a towel thrown in, to save their fighters of taking even more damage late in the fight, but the bouts continued, and neither of those guys has ever been the same again. Or even more recently Priscilla Cachoeira who suffered a vicious attack by Valentina Shevhenko in a fight where the corner, referee and doctor all failed her. We have seen some instances where the corner made the right call and stopped the fight for guys like Joe Lauzon when he fought Chris Gruetzemacher, Nate Marquardt when he fought Kelvin Gastelum, and Nate Diaz when he fought Josh Thomson, but those are pretty much the only corner stoppages I can think of, whereas I can think of many more instances of where an MMA fight should have been stopped but wasn’t. There’s this mindset by MMA corners for the fighters to ‘tough it out’ but at some point you have to know your fighter is completely done and have the fight stopped for the safety and long-term future of your fighter. Letting them take unnecessary punishment for a slight Hail-Mary chance of a win just isn’t worth it. As Nunes said in the post-fight press conference when asked about Pennington’s corner not stopping the fight, “it’s sad,” and that’s the straight-up truth. The only positive that comes out the Raquel Pennington stoppage is that it shines a spotlight back onto the topic of corners stopping fights. Considering how much criticism her corner has received from fans, fighters and media in comparison to the faint praises it’s drawn from old-school circles should show MMA corners that they need to seriously listen to a fighter when they say they’re done, or recognize when their fighter is done. At UFC 224, that did not happen as Raquel Pennington’s corner failed her. This has happened so many times in the past and it really needs to stop happening. MMA corners need to recognize when their fighter is done and save their fighter to fight another day, because as we saw at UFC 224, the downside to not listening could be career-altering. Do you believe Raquel Pennington’s corner failed her at UFC 224?